Cracking Cross Country Season So Far! Our Cross Country season started back on Thursday October 2nd when our team of 41 (!) runners ventured over to Coombe Dean school. This year the races have be opened up into two age group categories with children running in either the Year 3/4 or 5/6 races for boys and girls. For the Year 3/4 children this was their first experience of competitive cross country, and the children did us proud over the mile long course. In a field of 70 children we were very impressed to have all our girls back in the top 40, with Jessie (Y3) coming in 5th place and Aimee (Y4) achieving an amazing 2nd place! In the boys race there was another super effort with Ben, Javier and Luke (Y4) all coming in the top 20. The Year 5/6 children were competing against an even larger field of 90 children. The girls showed outstanding perseverance over the longer course, with Molly (Y6) achieving 7th place and Indie (Y6) coming in 6th. In the boys race both Hardiman brothers finished in the top 20, with William securing 4th place! During the following week we ventured to a very wet and muddy Plymbridge Woods for the second race. Again there were some superb performances from our Year 3/4s, with Aimee coming 4th and Jessie pipping her to the 3rd place medal! The Y3/4 boys were against a stronger competition, with Ben and Javier still coming in the top 30. Special mention must go to Darrell (Y4) for showing amazing sportsmanship by helping and encouraging a boy from another school around the course at detriment to his own position. The Y5/6 team had been culled by ill health but still managed to see Molly, Indie and Maya (Y6) achieve top 20 positions and Leah (Y5) only just missing out in 22nd, while Zac (Y6) came in 4th place for the boys. 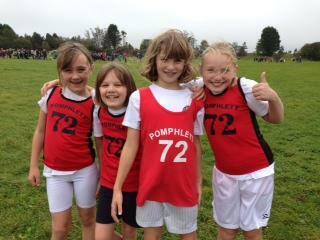 Then on 23rd October we took a selected team of 22 to the Plymouth Schools event at Staddiscombe. The field was suitably muddy and the course suitably long for the citywide event! Our Y3/4 boys performed brilliantly with special mention to Ethan (Y3) achieving 11th and Ben (Y4) coming in 9th place. 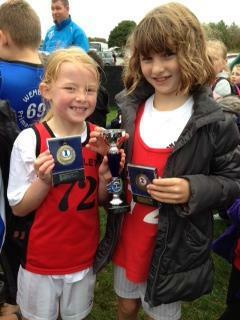 The girls then took over with an outstanding team effort with all girls coming in the top 30 runners. The hard fought rivalry and superb endurance of our girls led to Aimee achieving 2nd place and Jessie a fantastic 1st in the City! The girls team had stormed to TEAM GOLD against some very strong competition and this has led them to qualify for the Devon Y3/4 cross country event at the Winter School Games in Paignton in March! A feat we have never achieved before and that we are incredibly proud of! In the older age group, competition was fierce but again our girls team achieved superb top 30 positions, including Leah (16th), Maya (14th), Molly (12th) and Indie (10th). This led them to TEAM SILVER, another superb achievement! Finally the boys took to the course with our top 4 runners coming in the top 12!! 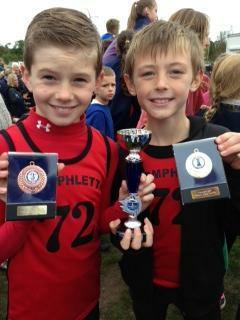 Including Tom and Aiden from Y6 coming in 12th and 7th place respectively. This put Zac in Bronze medal position and William achieving the Gold! These superb achievements led to our boys also winning TEAM GOLD! We are so proud of everyone who has run in all of the races and really showed the true meaning of Pomphlett perseverance! Many thanks must also go to Mr Spamer who has been training and run with them in all weathers! Also to all the parents who have provided transport and support at all the races, without you we would not be able to enter these events! We look forward to the next stage of the season in January! WELL DONE TEAM!